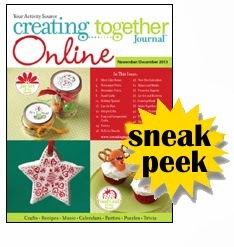 Take a peek inside to see a few of our amazing, time saving and fun ideas that we put in each issue of Creating Together Journal Online November & December 2013 easy, fun and creative project ideas. When you subscribe you’ll find over 40 pages of information, ideas and activities to make your job easier. Click here for your Sneak Peek!